Rebecca: What inspired your current mermaid persona & look ? Hannah: I have always been inspired by the mermaid mythology. As a tiny child I was drawing images of underwater sirens with flowing hair and snious tails. When I saw the film SPLASH starring Daryl Hannah when I was 9 years old. it seemed like the perfect embodiment of what a mermaid should look like. Natural, innocent, beautiful and other worldly. My first tail (at age 9) was modeled on the tail from that film. Since then I have found a particular style and look that has been created from my own preferences, materials available, and my own aesthetics sensibilities. Rebecca: Being a mermaid that has been featured in short films, I was curious to know your feeling on how the mermaids were portrayed in "POTC4" and Peter Pan. Rebecca: You can hold your breath for 2 min and swim to depths of over 30 feet how did you train to achieve such unique & extreme mermaid talents ? Hannah: I was always a water baby, despite not having grown up near the ocean. I felt comfortable in water and played endless games diving to the bottom of the pool and having breath hold competitions with my little sister. 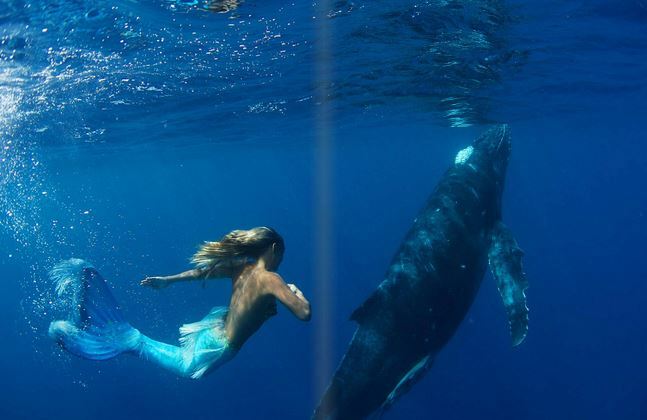 I already swam like a mermaid with my legs held together before I saw the film SPLASH and created my first tail at age 9. I have practiced yoga and deep breathing my whole life which is invaluable in breath holding, and also dance and movements to create a flexible spine and fitness.